Sometimes a band is just bubbling along, minding its own business, when one of their songs explodes and changes everything for them. That happened this week in 1991 when an indie rock group became the biggest band in the world almost overnight. OK, it hadn't really been overnight, but thanks to that huge single, the band were suddenly selling 10 times as many records, winning MTV Video Music Awards and, later in the decade, selling out arenas. Not bad for the alternative radio favourites who'd only ever had one hit in Australia up until that point. The biggest single this week in 1991 was still "Sucker DJ" by Dimples D, which held down the top spot for its second and final week. What were they thinking? After a flawless run of singles, the Belgian dance act rightfully bombed out with this track featuring brand new vocalists. They'd course correct quickly enough. Poor Mondo Rock, things really were getting pretty dire for the band who'd once been regulars in the upper reaches of both the singles and albums charts. "I Had You In Mind" became the band's second single in a row to peak in the 90s despite not being that bad a song, just somewhat forgettable. Unsurprisingly, once a third single from Why Fight It? 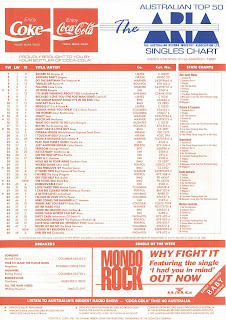 missed the top 100 completely, singer Ross Wilson broke up the band for a fourth time in its history. Except for the odd short-lived reunion in the past decade, this split stuck and Mondo Rock was no more. 2) "Highwire" was an uncharacteristically political song from the band in which they expressed their opinion on the events that had led to that year's Gulf War. And so, given "Highwire" was hardly "Start Me Up", number 54 is about as good as could be hoped for. 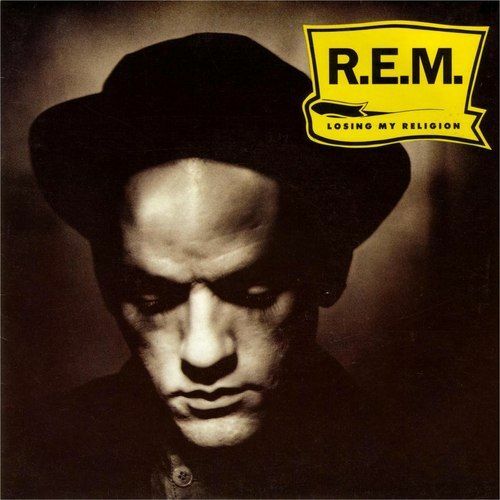 Number 49 "Losing My Religion" by R.E.M. While the hit-making days of one of the world's biggest rock acts of the '60s, '70s and '80s were over, one of the most successful bands of the '90s were just coming into their own. R.E.M. had been releasing music since 1981, and had slowly but surely built a loyal indie rock-loving audience. It took until their fifth album, Document, for them to land their first US top 10 hit with "The One I Love" - a chart feat they repeated with "Stand", a single from their major label debut, Green. In Australia, another track from Green, "Orange Crush", had provided R.E.M with their only top 50 appearance to date. Suffice it to say, they were hardly rivalling U2 at this point. After a year off to recover from the Green tour, R.E.M. recorded their follow-up, Out Of Time, in the second half of 1990 and launched it early in 1991 with "Losing My Religion". Written around a mandolin riff composed by guitarist Peter Buck, the song is a tale of unrequited and obsessive love, compared by singer Michael Stipe to The Police's "Every Breath You Take". As catchy as the song was, the track's music video played a huge part in helping "Losing My Religion" become the band's biggest Australian and US hit up until that point. Directed by Tarsem Singh, the arty clip was laden with religious imagery - and even featured Michael lip syncing to the track, something he wasn't generally a fan of doing. Unlike anything else produced at the time, it was the winner of that year's MTV VMA for Video Of The Year as well as five other categories. And so, with four singles under their belt, Italo house pioneers Black Box released their inevitable mega mix - featuring only three of their chart hits on the 7" edit. Yes, "Fantasy" wasn't exactly the same pace as "Ride On Time", "I Don't Know Anybody Else" and "Everybody Everybody", but given the Earth Wind & Fire cover was their second biggest single, it'd would've been good to have worked it into the main version of "The Total Mix" somehow, although it did appear on the extended version. As we'll see in coming weeks, the producers behind "The Grease Megamix" didn't let tempo changes get in their way, so "Fantasy" could've had more of a presence here. As these kinds of singles went, "The Total Mix" wasn't bad in a haphazard sort of way. If you didn't own any of the songs already, it was a cheap way to add all three to your collection (kind of), but the mix lacked the finesse of Technotronic's "Megamix" - still the gold standard. Next week: two big stars, two often over-looked hits. An Australian legend and American diva debuted on the top 50 with singles that you don't hear much about anymore, despite the former being an ARIA top 10 hit and the latter being a US number 1. Love your blog- Read it every week. I bought the cassette single of the total Mix and on there the version was 9:27 and included Fanasty remixed as part of the track. The link above it to a poor audio quality version i found. Thanks for your blog - love learning all these things about my favourite acts. Like I didn't even know Turn it up was a single!! Thanks for the heads up (and for reading!) - weird that they only included Fantasy on the extended mix and not the shorter version. I'll amend the post to include that info! I never actually heard the Technotronic track until a couple of years ago, deciding to look it up on youtube. I saw it in the stores though. Maybe there wasn't a video, given that there's none on youtube, and it's not on their DVD release. Getting 2 new randoms to front the group wasn't a good idea, though. "A touring act who put out new music every so often" - sounds like Madonna these days. I don't think I've heard 'Highwire' before, but remember seeing it as a breaker. I like some R.E.M. songs, and while 'Losing My Religion' is OK, it's definitely not one of my faves. The mandolin riff was something different, though. Like Anonymous, I too bought the ‘Total Mix’ cassingle - a rip-off really at $6.95 (because it was a 12" cassette), partly because I wanted to hear the mix with 'Fantasy' included. I've always thought it strange how much of the mix is taken up by 'Everybody Everybody', their worst-performing single outside of the US until that point, and that part of the megamix is unchanged from the original single version to my ears. Of the megamixes that were produced around this time, the Snap! one was my favourite. Turn It Up is rather forgettable and by now I was getting rather tired of their sound. 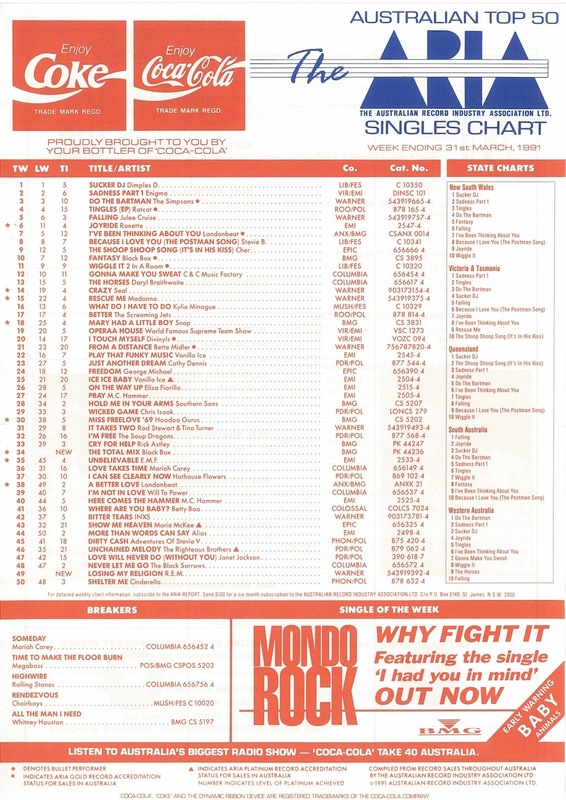 Mondo Rock and Ross Wilson in particular were laughable by this time and were purely riding on the coat tails of all the other Australian artists doing well in the charts. So it was no surprise I didn't find I Had You In Mind not appealing at all. Highwire is rather average but the live album it comes from Flashpoint, was probly my first Stones live experience and I still enjoy it today. Losing My Religion has been a cult classic on RAGE since it's release but it took me years to realize it's beauty. Another mega-mix, this time from Black Box and for me it was the worst of the bunch released around this time.